And the women have it! Last night saw the 2016 Australian Society of Fish Biology and the Oceania Chondrichthyan Society conference draw to a close in Hobart. 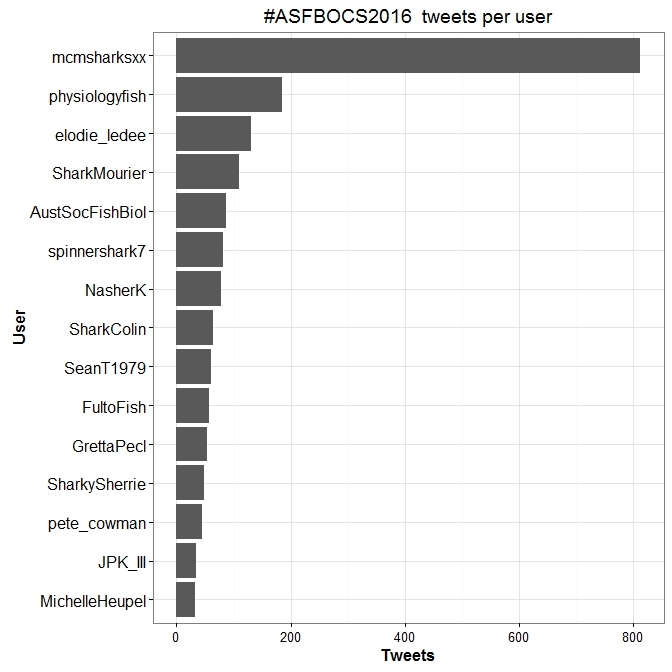 You might be wondering, who won the fight in the #ASFBOCS2016 twittersphere, fish or sharks? Well, it was neither - the theme of #womeninSTEM blew both right out of the water. The opening session, which showcased the great women working in Ichthyology in the region, and presented a panel discussion on gender equity in science, paved the way for a focus on breaking down barriers and removing unconcious bias. How do I know this? I collected tweets from the conference (using the Twitter Streaming API and labelled with the conference hashtag #ACRSOCS2016). I evaluated the 3069 tweets collected to discover common themes, general attitudes and emotional content. First, I tallied up the most common hashtags used at the conference, separating out original tweets from retweets. Not surprisingly, hashtags revolving around sharks and fish were dominant features. 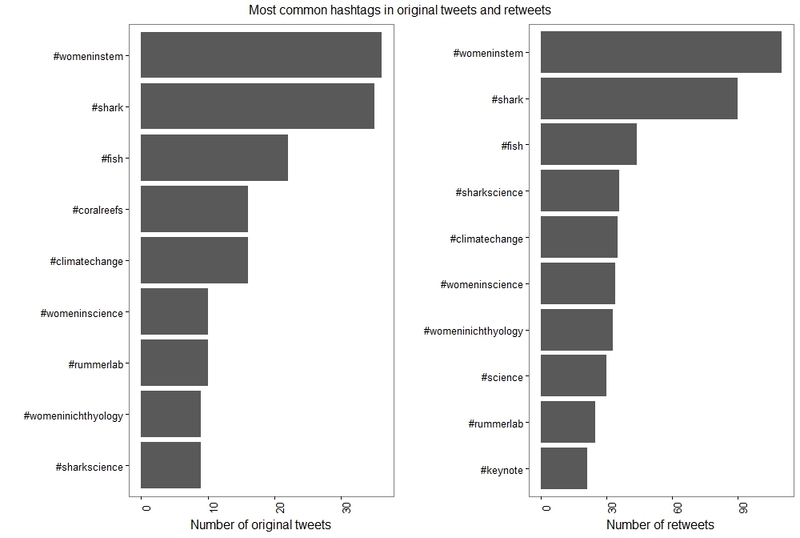 But, more interestingly, #womeninSTEM, #womeninscience and #womeninichthyology were all in the top ten tweets and retweets, and collectively far outweighed other themes. ​@AustSocFishBiol: "@MichelleHeupel on sticking with it: "Don't listen to the people who say that you can't, or you shouldn't, or you won't" #ASFBOCS2016"
@FultoFish: "Diversity is key to innovation: some of the incredible women who bring excellence to fish & fisheries #ASFBOCS2016"
Next, I looked at the top tweeters - @mcmsharksxx won hands down! 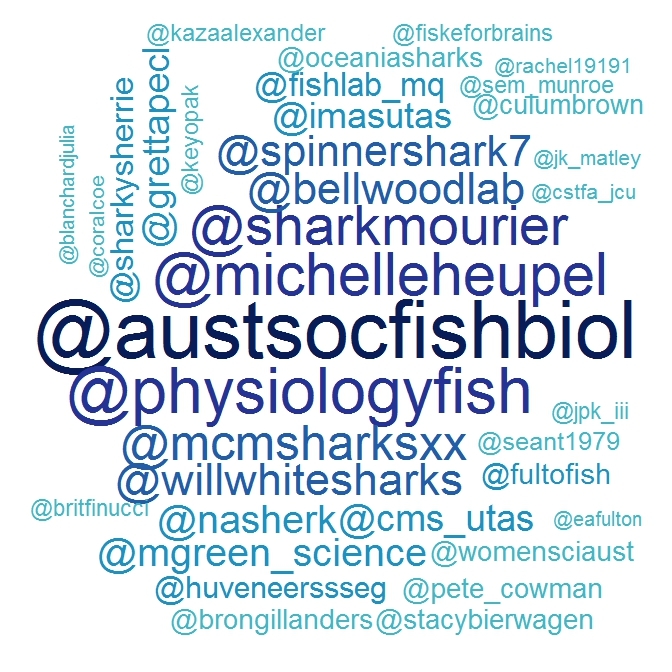 Whereas, looking at the most common twitter handles mentioned in tweets, not surprisingly, the Australian Societiy of Fish Biology (@AustSocFishBiol) stood out, but @physiologyfish and @MichelleHeupel were hot on the heels of ASFB! I also wanted to know, who is connecting with who? 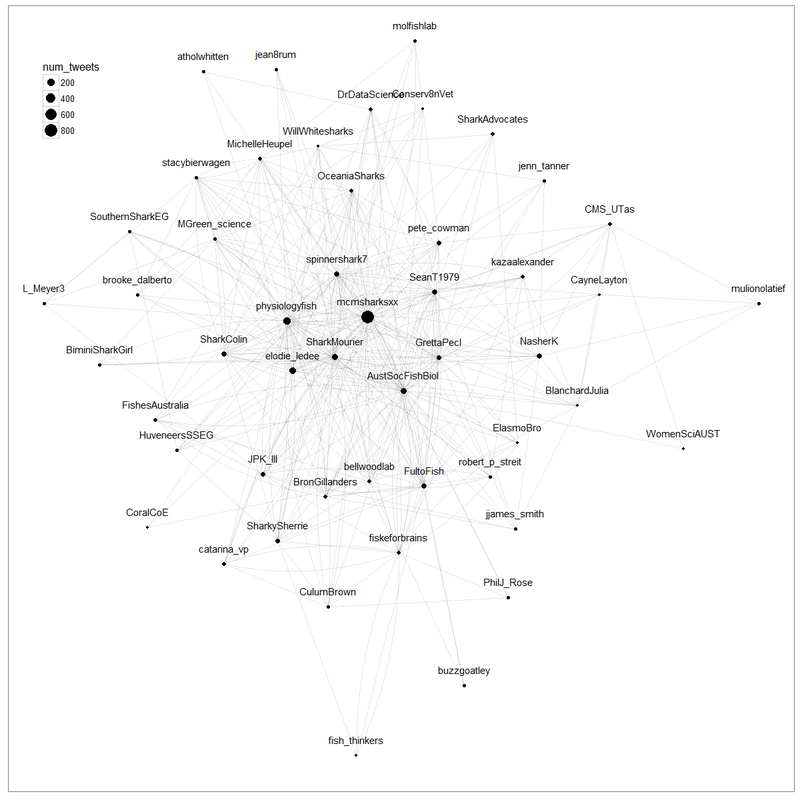 Which tweeters connected with most other people at the conference, either by retweeting tweets, mentioning twitter handles or having their own tweets retweeted? The massive online effort by @mcmsharksxx and her engagement across the conference is very clear, but @SharkMourier, @spinnershark7 and @GrettaPecl also rate a mention. 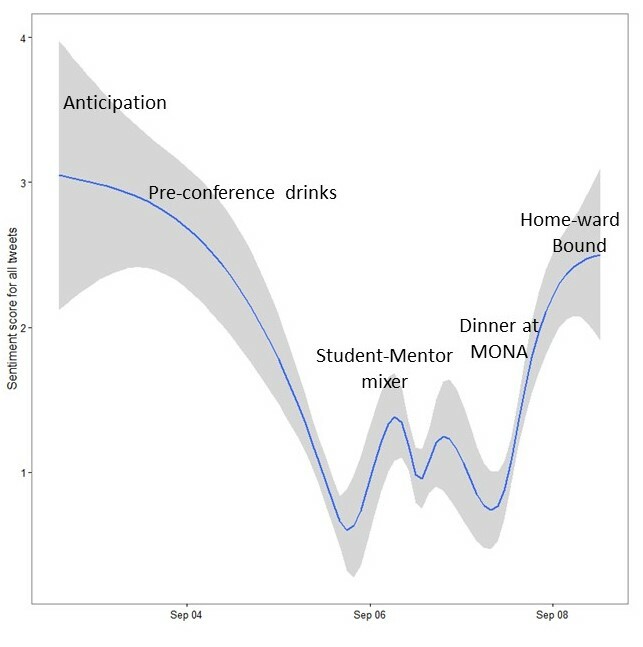 I also analysed the sentiment of the conference tweets, to see how it changed over the course of the conference - funny to see how the positivity of the sentiments peaked around the social events!